Collect the all orders and reach 30000 points to complete the level. 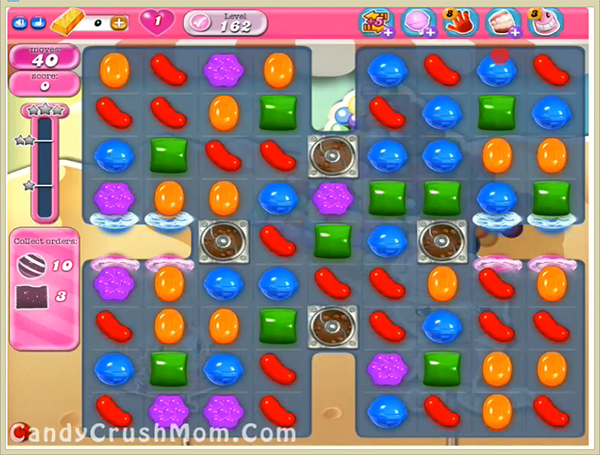 This level have normal difficulty and you need to make few striped candy. For this level you need to play from bottom if you don’t have chance to make stripe candy and try in every move to make striped candy plus break chocolate so they wont increase automatically. You could easily make within 40 moves as you don’t have make combos so try to complete before few moves so you can get three star score. You could make striped candy plus colorbomb to complete orders fast. We completed this level with 61200 score and got requirement before eight moves plus got three star score at thee end of the level.